Our Legacy Circle committee would love to speak with you and answer your questions. We can also refer you to our partner “The Jewish Community Foundation of Greater Mercer” who is managing Or Chadash’s endowment. They have experts to help you determine which method of giving is best for you. The Book of Life symbolizes the true concept of L’Dor V’Dor, passing on traditions from one generation to the next. Individuals or families, at their discretion, may enter the Book of Life when they “promise” a legacy gift or establish an endowment of any amount. The “promise form” is a non-binding letter of intent. To honor you for this gift Or Chadash has established a Legacy Circle Book of Life. You have up to one page to share your thoughts and experiences that inspired the gift. Your statements along with a photo of you or family are kept on permanent display at Or Chadash in a custom designed binder and also on our website in digital form. Optionally, in the digital version, you may add slides and music that are specific to your page for current and future generations to enjoy. 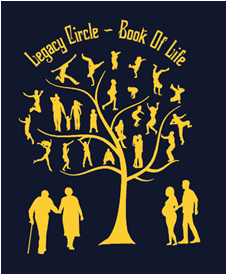 To view the digital version of our Legacy Circle Book of Life click here. Interested in learning more? Contact a Legacy Circle Committee Member. Over 25 years ago, a small group of Jewish families in Hunterdon County shared a dream. They dreamed of a home in which they and their loved ones could worship, educate their children, celebrate life’s happy occasions, and reach out together to help those in need. They did more than imagine. They invested their time, energy, imagination, and money to build a community, and eventually a synagogue. Today, we are living in the future they only imagined. Or Chadash’s first 25 years were their gift to us. The future is in our hands. We invite you to join in continuing their legacy by becoming founders of the gift we will leave to future generations. The synagogue is the central institution in Jewish community life. Or Chadash is where we worship, educate ourselves and our children and grandchildren, extend support to one another and the broader community and celebrate life cycle events. Or Chadash is the center of Reform Jewish life in Hunterdon County and a valuable contributor to central New Jersey’s Jewish community. A Legacy Gift to Or Chadash provides income for our congregation’s current and future needs. It provides stability in times of financial uncertainty and helps us launch and sustain new programming. Just as a family’s savings provide security for the family’s future needs, Or Chadash’s Legacy Giving Program creates a more secure future for our community. As funds grow, they will help Or Chadash flourish in the decades ahead. When thinking about the future, we all worry about the worldly needs of those we will leave behind. We must also concern ourselves with the world they will inherit. By including Or Chadash in your estate planning, you will help ensure that future generations inherit a home for Jewish life, education, and community. You will help them take their place in the chain of generations reaching back to our ancestors. Your gift guarantees the Jewish future, here in your community. To be a part of this unique program is quite easy. The first thing to do is simply to fill out a Promissory Letter of intent. This letter is not a binding document but lets us know that you are committed to help secure Or Chadash’s legacy for years to come. A Promissory Letter can be viewed & downloaded by clicking here. An example of a completed Promissory Letter can be viewed by clicking here. Once complete you can mail it or drop it off in person but please make sure it goes to the attention of the Or Chadash Treasurer. After you fill out the Promissory Letter, you are expected to make the necessary arrangements so your “promise” can be executed in the future. As indicated on the Promise Form, you estimate how many months are required to make these arrangements. This can be revised as needed. That is it! We thank you in advance for looking out for the financial well-being of Or Chadash so that future generations enjoy the community that has been established at our temple. What is the Or Chadash “LEGACY CIRCLE” program? The “Legacy Circle” program has been established to provide permanent income for our congregation’s current and future needs for generations to come. It will provide stability in times of financial uncertainty and help us launch and sustain new programming. What is a Legacy Gift & how does it work? A legacy gift is placed into our newly established Endowment Fund, creating a permanent income stream. Legacy gifts can be made during your lifetime by an outright contribution or in the future through a provision in your will or other financial products. What are some common options I have for creating a Legacy Gift? Making a bequest through a provision in your will naming Or Chadash. Setting up a charitable gift annuity or donor-advised fund. Do Legacy Gifts have to be large? No. Any gift is much appreciated. Is it complicated to create a Legacy Gift? A Legacy Gift begins by signing a simple non-binding letter of intent called a “Promise”. You communicate your promise to create a Legacy Gift by following the instructions on the My Promise form. Your legacy gift or bequest can be as simple as specifying any percentage of your estate you want to give or a dollar amount or some combination (i.e. X% not to exceed $X) of your estate. What should I do if I have questions that aren’t addressed here? Please reach out to a member of the Legacy Circle Committee. If they are not able to answer your question, they can connect you with someone who can help. I see “Jewish Community Foundation of Greater Mercer (JCFGM)” on some of the Life and Legacy materials. Who are they? The JCFGM supports many synagogues & Jewish organizations with endowments and resources that maximize the charitable objectives of their donors. Or Chadash partnered with the JCFGM to manage our Endowment Fund, provide training/support with the launch of our “Legacy Circle” program, obtain a $5,000 grant by achieving our year end program objectives, and provide expert advise to our congregation as needed. If you’d like to learn more about JCFGM and their work, please see their website www.foundationjewish.org for more information. Can I leave a Legacy Gift to fund a specific program with special meaning to me? It is possible to leave a Legacy Gift designated to fund a special program. These types of arrangements require careful planning. We recommend that those considering this option consult with members of the Legacy Circle Committee . Why should I leave a Legacy Gift? Or Chadash plays a vital role in the lives of our families, students, and the Hunterdon County Jewish community and in your life. A Legacy Gift ensures that Or Chadash can continue to fulfill that role for generations to come. Just as we each leave a legacy for our loved ones, we should also leave a legacy for organizations that bring joy and meaning to our lives. How are Legacy Gift donors recognized? In appreciation for your intention for leave a Legacy Gift, you will be honored by joining our Legacy Circle and entered into our Book of Life. You will be given a page to submit a short story and picture. The story can reflect some of your life history, values, motivation for your legacy gift, why you joined Or Chadash and dreams for the future. This will be a permanent historical record for your family, friends and future generations to view. Like almost anybody who has picked up a golf club, my stepfather has always had a fantasy: To play at the Augusta National Golf Club. The legendary Georgia course is home to the Masters Tournament, and admission is strictly limited to its closely guarded roster of members and their invited guests. Neither I nor my stepfather knew a soul there. So when I said I wanted to surprise him with a round of golf there, everyone I talked to said it would be impossible. Why would an absolute stranger invite a 70-year-old suburban Detroit real-estate developer to Georgia to tee off at one of the world’s most secretive and exclusive clubs? In a season of giving, this is a story of acts of generosity, each one a little more surprising and heartfelt than the one before. It starts with my attempt to thank my stepfather, Robert Rosin, for the lifelong, selfless gift he had given to me and my family. Bob married my mother, Suzanne, more than 30 years ago, when I was 2 years old, and my sister, Lizzie, was 4. Though he already had three children, Bob treated us as his own. As Bob’s 70th birthday approached early last year, our family had little to celebrate. Nearly a year earlier, my mom was diagnosed with lung cancer. At the time, she was 58, a nonsmoker and longtime Pilates instructor. Some doctors were reluctant even to treat her advanced cancer, but Bob stood by her and us through two surgeries, three courses of chemotherapy, two rounds of radiation and a coma that lasted nearly two months. When doctors told us to make funeral arrangements, Bob refused to give up. He fought with doctors who told us that there was no hope, and led our formerly secular family in prayer. When my mom came out of the coma, he saw her through an exhausting rehabilitation, and as she relearned how to swallow, walk and talk. This would be no simple dream to realize. Augusta National is shrouded in institutional silence. It has been at the center of controversy over recent years because it is has admitted no women and few black members. The club comments publicly only through an official spokesman, and only about the Masters; it refuses to disclose its members’ names or even how many there are. Published accounts place the membership at about 300. Founded in 1932 in eastern Georgia, Augusta National was conceived as a winter club for Northern industrial leaders and friends of co-founder Robert T. “Bobby” Jones Jr., the era’s premier golfer. According to people familiar with the club’s history, a small percentage of the membership would be drawn from the Augusta and Atlanta area. The club’s founders started an annual, invitational tournament that became the Masters, the sport’s elite event. While professional golf’s other three major tournaments — the U.S. Open, British Open and PGA Championship — are played at different courses every year, the Masters is always played at Augusta National. Every significant player since 1934 has walked its fairways. By the time my mother returned home after her coma, I had grown particularly tired of being told about impossibilities. Maybe I couldn’t cure cancer. But maybe I could arrange for the golf outing of a lifetime. I had one faint hope: In the age of the Internet, perhaps even Augusta National couldn’t keep all its secrets. I did an online search, and discovered one newspaper had published what it said was the club’s list of members. I couldn’t be sure it was accurate, but it included names like Jack Welch, Warren Buffett and former defense secretary Melvin R. Laird. (Representatives of Messrs. Welch, Buffett and Laird confirm they are members.) I then found the home addresses for some 40 members living in Georgia. I decided to write to them. I explained my mom’s illness, my stepdad’s role in our family and our desire to surprise him with a memorable round of golf. I said I lived in New York and worked as a journalist. (At the time, in early 2004, I was a freelance reporter and not employed by The Wall Street Journal.) My husband said he thought the letter was too long — over one typewritten page — and pulled too hard at heartstrings. “Heartstrings are my only hope,” I remember telling him. I employed one arguably wily tactic: I enclosed two family photos with each letter and, on the outside of the envelope wrote, “PHOTOS — DO NOT BEND.” I reasoned that my appeal might resonate with some member’s wife — and that a good way to attract a wife’s attention would be send her husband a letter, with pictures inside, addressed in a woman’s hand. The first response came swiftly. Boone Knox, a retired banker from Georgia, called within a week. He and his son were planning to play soon, and Bob could join them if he could get to Augusta in two days. My mom had a medical test scheduled, and we knew we couldn’t make the arrangements in time. In thanks, my sister and I sent Mr. Knox flowers. But then my mailbox began filling up with polite regrets. “I appreciate your letter,” wrote Carl E. Sanders, who was Georgia’s governor from 1963 through 1967. Now 80, Mr. Sanders wrote that he couldn’t play golf due to an injured back. “I wish you and all your loved ones the best,” he wrote. Another member wrote: “As you may imagine, requests for a round of golf from friends, clients, friends of friends, old school mates, relatives, etc. use the time I can devote to golf entertainment. I am sorry.” When I called recently to ask him about the letter, he declined to be identified. “I wouldn’t want to encourage anyone else to try your trick,” he said. About a month passed. Bob’s birthday celebration was in less than a week. My sister and I were crestfallen at the thought of heading to the gathering in Tucson, Ariz., where my mother was recuperating, without a gift. My mom told me to compile a scrapbook with the letter and pictures I had mailed, plus the responses I had received. “Just showing him what you tried to do for him will be present enough,” she said. I was putting letters into an album one evening when the phone rang. In a thick southern accent, the caller identified himself. “This is Dessey Kuhlke from Augusta, Georgia,” he said. He told me he had read my letter over and over again since it arrived the previous month. Each time, he told me, he thought of another reason why he should say no. “But none of the reasons seem good enough,” he said. It was as if someone had given me a gift. That weekend, we handed Bob the photo album. He stared at the book for about 20 minutes, muttering again and again: “Say, ‘Honest to God.’ Say, ‘Swear to God.” For two weeks, he carried that book with him everywhere. Mr. Kuhlke was born in Augusta, like his father and his grandfather. He joined the Army after high school and then graduated with a business degree from Georgia Southern University in 1963. He joined his family’s construction business, retired in the mid-1980s when he and his brothers sold it, and has focused since on private investing. He and his wife, Barbara, had three children: David in 1968, Cathy in 1972 and Brian in 1975. Mr. Kuhlke was invited to join Augusta National in 1993. When he was at the top of this game, he was not a bad golfer. His best round was in 2000 when he shot a two-above-par 74. “It was an aberration,” says Mr. Kuhlke, now 64 years old. Mr. Kuhlke and I discussed sending Bob to Georgia in December 2004. But as the date approached, my mom grew terribly ill. In September, I asked Bob what he thought of flying in a few months to Augusta. He winced. I told Mr. Kuhlke that my stepfather had chosen to stay with my mother. He assured me his offer wouldn’t expire. I met Mr. Kuhlke in person a few months later, when he and his wife traveled to New York City and my husband and I met them for dinner. Over the next several months, I’d email him copies of my articles. He’d call to ask about my mom. Our conversations weren’t light: He asked me a few times if I, as a Jew, believed in an afterlife, and he shared his Christian views with me. I felt that he took a pleasure in comforting others. When you’re sad a lot — and when your parent is dying slowly you’re sad a lot — you sometimes worry that your sadness makes other people uncomfortable. With him, I felt the opposite. He helped me confront the inevitability of my mom’s illness. Even though I was nearly half his age and from a different walk of life. Even though I was a virtual stranger. Earlier this month, on Dec. 5, my stepfather flew into Columbia, S.C., a 70-minute drive away from the course. Mr. Kuhlke was waiting to pick him up in his gray GMC Envoy SUV. The two of them, meeting for the first time, talked all the way to Augusta. As far as my stepdad knew, he would be staying at the Radisson hotel in town. On the way downtown, Mr. Kuhlke told Bob that he needed to take care of something at the club before dropping Bob at the hotel. They walked through the club’s main house and onto the grounds, which has 10 cabins that serve as accommodations for members and their guests. Mr. Kuhlke led Bob to the Jones cabin, a bungalow near the 10th tee named after the club’s co-founder. Mr. Kuhlke showed him the living room, dining room and two bedrooms. “Do you ever stay here?” Bob asked. “I was dumbstruck,” Bob said later. Augusta National permits guests to take photos and to share their stories with others. The details of their time in Augusta come from interviews with my stepdad and the two partners he invited along — his close friend Don Kwasman of Tucson, and my husband, Joe Ehrlich. When I first discussed with him my desire to publish a story about this experience, Mr. Kuhlke was wary. Not only is he a private person, but he didn’t want to subject the club to attention that might upset the members. But he agreed that he would cooperate, in part because he believed such a story would be comforting to those who had overcome loss, not least its author. He later told me my letter was hardly the first of its kind. Mr. Kuhlke says that in his 12 years as an Augusta National member, he has received other “death letters,” as he calls them — “more than I could put a number to.” About 10 years ago, he heard from a man who said he had six months to live. Mr. Kuhlke obliged him his dying wish and took him golfing at Augusta. Three years later, the man called again asking if Mr. Kuhlke would host his boss. Mr. Kuhlke gives the benefit of the doubt. “Maybe the course cured him,” he says. Don and Joe arrived a few hours after Bob, and in the evening the four convened in the Jones cabin. At a table set up in the living room, a staffer served them fried chicken, collard greens, corn on the cob and apple-bread pudding. After the meal, the men adjourned to the living room. Sitting beneath a portrait of Bobby Jones that had been painted by President Dwight D. Eisenhower, they drank Grey Goose vodka and Famous Grouse scotch until 1 a.m.
Before his first hole the next morning, Bob took in the scenery. In front of him was a perfectly groomed fairway. To his right was the sprawling white clubhouse — originally an antebellum plantation — with its two-story porches and blooming pansies. To the left was the 18th green, where earlier this year Tiger Woods sunk a 15-foot birdie putt in sudden-death play to win his fourth Masters. Bob drew back his club and uncorked about a 215-yard drive, landing his ball at the top of a hill on the fairway. “I hit it straight down the middle,” he says. “I felt good.” Over the next two days, Bob, Joe and Don played 36 holes, plus a round on the course’s nine-hole, par 3 course. If for a moment the foursome forgot the course’s history, there were reminders. On the 13th hole, my husband, Joe, landed his ball in a swale between a semi-circle of sand traps and the green. Joe expected to reach the green with a pitching wedge. His caddy — all golfers at Augusta National are assigned one — advised him to wedge himself out with a putter. “Really? A putter?” Joe asked. The caddy responded: “When Jack Nicklaus had his ball in the exact same place, he used a putter. But you do what you think is best.” Joe did as told, and missed the cup by about 15 feet. As for why Mr. Kuhlke offered to take my stepfather golfing, he explained only later. Sometimes, particularly in a moment of grief, a stranger can make the biggest difference, he said. Mr. Kuhlke’s adult life has been marked by tragedy. In 2002, his eldest child, David, died at 34 after a long illness. Sixteen years earlier, his younger son, Brian, died at 10 years old after a playground accident. Mr. Kuhlke says he was helped through, in part, by kindness from unexpected sources. When Brian died, he was contacted by a minister and writer named John Claypool who had learned of the death from a mutual family friend. Dr. Claypool, who had lost a young daughter years earlier, began calling the Kuhlkes to counsel them as they mourned. Mr. Kuhlke says it was his dream to meet Dr. Claypool in person, and did so in 2002. “He was the kind of person who put into words the kind of things you were thinking but could not express,” he says. Dr. Claypool died earlier this year at age 74. The night before my stepdad was to arrive in Augusta, Mr. Kuhlke and I talked on the phone for more than an hour. I told him that in the days leading up to the trip, my sister and step-siblings and I heard the first notes of excitement and optimism in Bob’s voice since my mom became ill. Hearing that, I told him, was a bigger gift than we ever could have imagined. After an operation to remove the cancerous bottom lobe of my mother’s right lung, another operation to remove a chunk of the left, oral chemotherapy, intravenous chemotherapy, more than a month spent in a coma, two so-called targeted therapies, weeks of radiation on the sacrum and a palliative hip replacement, our family found that perhaps the most innovative and effective tonic was something much more simple and yet much more elusive than all the other therapies. As we learned firsthand, a kind bedside manner is not merely a quaint characteristic you hope for in a family doctor. A doctor’s attitude toward a patient and the patient’s family colors every moment of a health crisis. It can help a patient to heal, keep those of us who suffer alongside her saner and healthier, and lower costs. And yet for all the advances in medical technology and research, simple kindness from health-care providers is all too rare. A recent survey conducted by the Arnold P. Gold Foundation, which advocates for a respectful bedside manner, asked 600 people to describe their interactions with doctors. Twelve percent said they were taken care of by doctors who didn’t know their names. Twenty percent had met with doctors they found “rude or condescending.” Forty-seven percent said they had felt rushed by doctors. My mother, Suzanne Rosin, was diagnosed with cancer in 2003 when she was 58. She was a Pilates instructor, a hiker, a runner, a dancer and, for 30 years, a nonsmoker. In an effort to beat the cancer, she was willing to submit to just about any treatment. She found doctors willing to administer chemo, zap her with radiation and remove parts of her organ. Harder to come by were those who allowed themselves to look at the person on the other side of the tome-size medical file. From the start, we were faced with doctors whose delivery of news was soft as sandpaper. After Mom’s biopsy result came back positive, my sister, stepfather, Mom and I went to see a surgeon in Mom’s hometown of Tucson, Ariz. He glanced a her file and looked quickly at the CT scan of her lungs. “Inoperable,” was all he said. The appointment might not have lasted a full five minutes. We thought the life of our mother was worth fighting for, so we eschewed the recommendation of Dr. Doom, as Mom took to calling him, and found a kind oncologist who told Mom, “If you want to fight, I’ll help you fight.” He connected us to a surgeon who disagreed with Dr. Doom’s certainty. No guarantees, he said, but he would try. I never could have imagined what a victory it would feel like to find doctors merely willing to try to save the life of a middle-aged woman. An even greater feeling of triumph came after the surgeon successfully removed the tumor. Our joy proved premature. When a second tumor was located, I pushed Mom to have the surgery performed at a large cancer hospital far from her home. Mom objected: She knew and trusted her Tucson doctors and felt there was value in being near her community. But I had become an establishment snob: I scoffed at the idea of her community hospital being a better choice than a big research hospital. I lobbied Mom relentlessly, and she finally gave in. A few days before Mom’s surgery, I began to regret that lobbying. We went to see the Big Hospital Surgeon for a pre-op appointment. The oncologist who referred us to him had warned us that he had a terrible bedside manner. That oncologist had a knack for understatement. The doctor’s eyes narrowed and darkened. “You’re worried about dancing?” he asked, his voice icy and incredulous. “You’re lucky I’m willing to operate on you at all,” he said before storming out of the room. Mom burst into tears. “Now he’s going to be mad at me when he’s operating on me!” she said. She dashed out of the examination room, found the doctor in the hallway and began to plead. “Can you forgive me?” she asked him, her hands shaking. The surgery went well, but the recovery did not. Mom developed pneumonia and ended up in the ICU of the Big Hospital. She was medicated into a coma and put on a respirator. Intellectually, we understood why health-care professionals who work with people who are dying might de personalize their work. And to be fair, when someone you love is sick, you look for something or someone to blame. Yet the doctors gave us plenty of reason to channel our rage in their direction. Mom languished in a coma for weeks before the surgeon finally agreed to sit down with our family. The oncologist who was overseeing Mom’s case at the hospital also disappeared after Mom was put into the coma. When I finally begged him via email to tell us what the pathology reports from the surgery showed, he informed me via email that Mom’s cancer had spread to her lymph nodes. Finally, there was an ICU doctor whose job was to care for the hospital’s most vulnerable patients but whose bedside manner was atrocious. He was impossible to pin down for updates on Mom’s condition. He seemed annoyed when talking to us. He snapped at us for having too many visitors in the waiting room. He was blase when Mom showed signs of improvement. When I stopped him in the ICU and pointed to a photograph of Mom in a black spaghetti strap dress from my wedding—I was trying to humanize her to him—he said, “This is what the mother of the bride wears?” Then he walked off. Yet just as our faith in the goodness of doctors was nearly gone, another man restored it. This doctor was also an ICU doctor, and though he was responsible for mom’s care far fewer days than we would have wished, his mere presence was reassuring. Whenever he could, he would sit down with us in a closet-size conference room and update us on Mom’s condition. He didn’t rush. He didn’t sugarcoat. He told us it was likely Mom would not survive the pneumonia. But he urged us to pray that he be proved wrong. I remember the moment vividly. And though during Mom’s hospitalization he never mentioned to me the circumstance that led to his comment, I knew. I knew he had lost someone he loved. And he was telling me he had survived the loss, transcended the loss, worked hard to be a better man because of the loss. For the first time, I considered the possibility that I might live through my mom’s death. Mom made it through the pneumonia, and back home to Tucson. She died there about 18 months later. She was 60. Years after the long hospitalization, I tracked down the doctor who filled me with such hope. He told me about the loss of his own father. His father had suffered a stroke, and after his family sat in a waiting room for eight hours before a physician came to update them, the good doctor’s mother turned to him and said (pointedly, as only a mother could): “Is this how you treat your patients?” Six weeks after his father died, my mom landed in his ICU. It is customary to bless the children each Shabbat and on the holidays. May God inspire you to live in the tradition of Ephraim and Menasheh. May God inspire you to live like Sarah, Rebekah, Rachel, and Leah. Y’va-reh-ch’cha Adonai v’yish-m’reh-cha. Ya-eir Adonai pa-nav ei-leh-cha vi-chu-neh-ka. Yisa Adonai pa-nav ei-leh-cha v’ya-seim l’cha sha-lom. May God bless you and keep you. May God’s light shine upon you, and may God be gracious to you. May you feel God’s Presence within you always, and may you find peace. Shabbat eve blessings for candles, wine, and bread. asher kid’shanu b’mitzvotav v’tzivanu l’hadlik neir shel Shabbat. *For the full text, see On the Doorposts of Your House , CCAR Press.